The robustness of the LCMS-8060 and modified ion optics was also assessed by injecting 2400 samples of femto-gram levels of alprazolam spiked into protein-precipitated human plasma extracts over a 6 day period (over 400 samples were injected each day). The RSD of peak area response was 5% over this test period, using a deuterated internal standard (alprazolam-d5) the RSD was 3.5%. As part of the robustness test the vacuum system was vented to model a transient power failure with no effect on signal response or baseline noise level. As with Shimadzu’s other triple quad systems, maintaining the LCMS-8060 is simple. 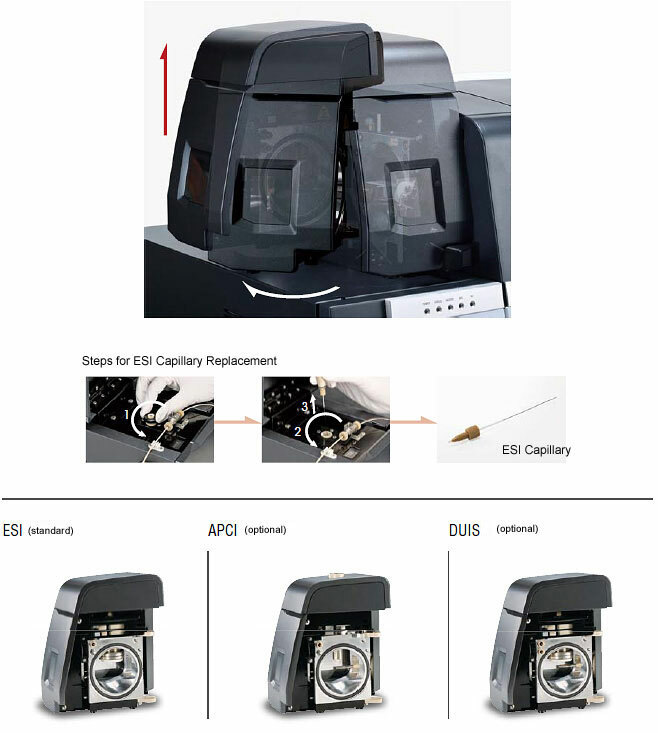 Replacing the desolvation line (DL) and ESI capillary is quick and easy. Additionally, the design allows users to replace the DL without breaking vacuum, providing greater uptime and usability. Designed without cables or tubes, removing the new ionization unit is simple: release a one-touch lever to open the unit and lift it out. In addition, no tools are needed to detach the needles fitted in APCI and DUIS units, allowing for easy maintenance.